A conversation with author and organizer Jane McAlevey about Janus v. AFSCME and the way forward for labor. Jane McAlevey is an organizer and author of two books—her first, Raising Expectations and Raising Hell, was named the most valuable book of the year by The Nation. This interview has been edited and condensed. Listen to Jane McAlevey on the Start Making Sense podcast. Jon Wiener: The Supreme Court on February 26 heard arguments in a case that could cripple public-employee unions: Janus v. AFSCME. Tell us about the case. Jane McAlevey: Mark Janus, the plaintiff, is an employee of the state of Illinois who sued his union to be released from having to pay what’s called an agency fee. He doesn’t believe in trade unions. He doesn’t like his union. He objects to their political activities. Back in 1977, in a ruling called Abood v. Detroit Board of Education, the Supreme Court gave workers like Janus an out: They don’t have to pay union dues. They can choose to become what’s called an “agency fee payer,” which means he pays about one-third less than regular dues payments—that’s the amount the Court decided the union was spending on politics. Agency fees cover the costs of collective bargaining. But Mark Janus doesn’t even want to pay for collective bargaining. Of course, his case is supported by millions of dollars from right-wing anti-union forces in this country: the Koch brothers, the Mercers, the National Right-to-Work Legal Foundation, the Bradley Foundation. Their purpose is destroying workers’ rights and destroying trade unions. That’s what at stake in the Janus case. JW: This case is likely to win in the Supreme Court, five to four. That means the 22 blue states—places like California, New York, Illinois, Massachusetts—are going to become what conservatives call “right-to-work” states. In states that switched to right-to-work laws recently, like Wisconsin, public-sector union membership fell by something like 50 percent. It’s crippling to the unions. Why would so many workers leave their unions under these circumstances? JM: The public-sector unions have become guilty of what we call business unionism. They function more like an insurance agency for workers who get in trouble. That’s not how public-sector unions began. There’s a direct historical line between the growth of the civil-rights movement in the 1960s and the state-by-state passage of collective-bargaining laws that enabled public-sector unionism. The civil-rights movement exploded into public-sector unionism. The women’s-rights movement that was built in the early 1970s exploded into public-sector unionism. In the 1960s and ’70s, there were big strikes. So the state had what the Supreme Court in Abood called “a compelling interest” in creating “labor peace”—by giving public-sector unions collective-bargaining rights. JW: How can we build strong unions now in a right-to-work state? JM: We can maintain high membership in a right-to-work context. We did it in Nevada. UNITE-HERE, the casino workers, did it in Nevada. The Carpenters Union did it in Nevada. A big SEIU union in Nevada that I was leading at that time did it. Three unions built a robust, high participation, high membership union in a right-to-work environment. But you have to trust the rank and file. It means you have to open up negotiations. You have to allow the rank and file into negotiations. It means the leadership engages the ordinary rank and file in the very life of the union, in contract talks, in politics, in how we think about administering what’s called the union contract day-to-day in the work place. When union leaders enable and encourage rank-and-file participation, they will, in fact, be able to hold high membership in a right-to-work environment. JW: Is there any chance the Supreme Court won’t give Janus and his backers everything they want? JM: There is a potential compromise proposed in a couple of the briefs in the Janus case that has gotten no attention: We allow unions to continue to collect agency fees, but we narrow the definition of what is allowed and permissible in collective bargaining. That’s the other potential outcome of this case. As a chief negotiator, as an organizer, as someone who has worked with hundreds of thousands of workers to win terrific contracts, often by threatening a real strike or holding a real strike, I’m much more concerned about the potential constraining effect on collective bargaining than I am about losing agency fee-payer status. 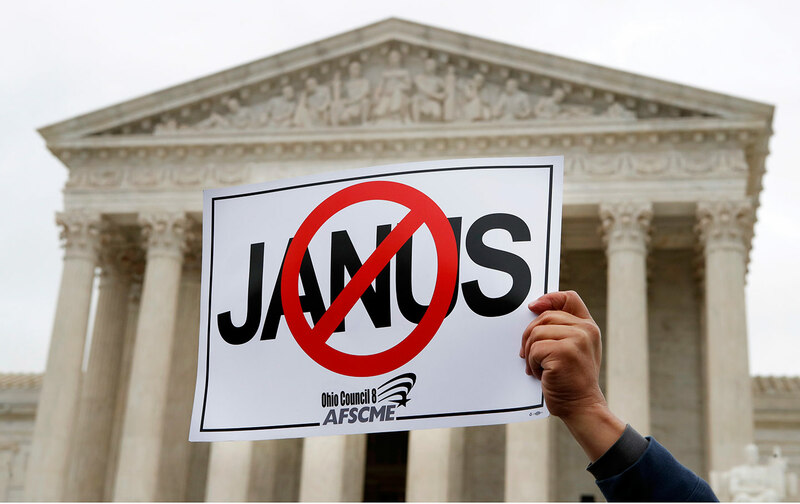 People are too focused on the question of fair share or agency fee and are missing the much deeper threats in the Janus case, which is fundamentally an attack on workers’ right to collective bargaining in the public sector.